There is no question, every single celebrity who steps on the red carpet always has a perfectly done hairstyle. Of course, they probably have a platoon of stylists who worked on their tresses for hours before they got to the red carpet event. It probably even costs more than the designer dresses they are wearing to achieve their look. If this is what the celebrities are willing to shell out just to get a perfectly done hair, does that mean that it is just impossible for you to get the same look? Of course not! Here are some of the top secrets in getting the Hollywood glam that you have always wanted. Soft Look—A lot of women are envious of the soft and delicate look that women celebrities showcase during red carpet events. It is seems like achieving the dainty appeal is so effortless for them. If you also want to have the same look, the key is in softening the way you do your hair. 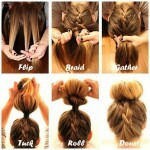 Instead of pulling your back tightly when you do your bun or chignon, do this loosely. Allow some of the strands to fall stylishly and create some curled tendrils to finish off the look. Hair Extensions—If you think Hollywood actresses have a magic potion which makes their hair grow long in just a short time, then it’s time to face reality. The trick is in wearing hair extensions. This is the key in achieving those intricately done updos even if their hair is not long enough. For some, the style of the hair extension is already pre-made. So, all they have to do is to create a simple bun and put the pre-structured hair extension to make it look like a laborious chignon. Concealing Pins and Clips—Are you wondering how their hair holds the style even if there seems to be no clip to hold it in place? The trick is in using hair spray and bobby pins. Directly applying hair spray on your tresses will keep all strands in place for hours. To hold the segments of your hair in position, use bobby pins which have the same color as your hair. Apply hairspray on the bobby pins too before you place on your hair so it would not budge even if you go dancing the entire night. Perfect Tousle—For some Hollywood actresses, they prefer the more ‘natural’ look. The truth is, there is nothing natural to it. Doing the perfect tousle starts by braiding the hair. This creates waves and curls. So, when the hair is pulled up to make a bun, the curls seem so stylishly dishevelled. Styling in Segments—This is a common trick done by the finest and most popular hair dressers to the stars. They segment the hair to three or more sections to achieve a complex hairstyle. First is the crown area, then the middle section and the layers closest by the nape. Whether you are mixing braids, twists or curls together, always start styling from the crown down to the section close to the nape. Even if you do not spend a lot of cash to hire the services of an entire team of stylists, you can still look worthy to strut down the red carpet if you try out some of these Hollywood secrets. You might need to spend some time to perfect the style but rest assured, it is all worth it. Here are some pictures of Red Carpet Hairstyles, enjoy.